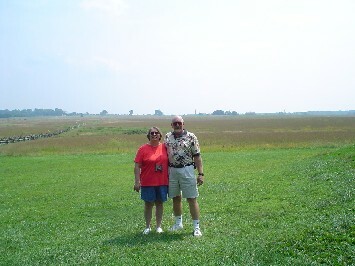 We had planned our trip to Gettysburg for 2003 but circumstances at work intervened and put us back. 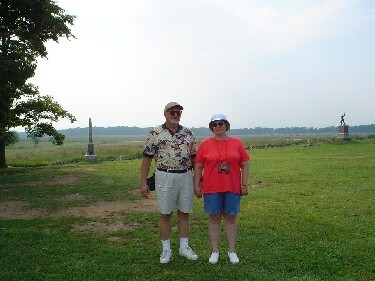 Others who have visited this historic site have encouraged us to go and we are glad we did. We only stayed two days since we intended to drive north to take in Niagara Falls as well. This worked out really well for us and the drive north and west across the mountains of Pennsylvania was alone worth the trip. Again, we took the bike on the trailer so we could ride locally and this method is becoming a favorite of ours. We dearly love to ride the bike but those long hauls are better made in the comfort of the truck. This is on an overlook during the drive east looking down at Mechanicsburg. Having been raised in flat country every time I see a little hill it impresses me. Before we left for Gettysburg my friend Mick (a comedian) told me that it looked like a good place to have a battle because there were all these monuments to hide behind. This is near the cemetery on Cemetery Ridge where the Union army made its stand. They do a great job at the park giving visitors a colorful look at the past. 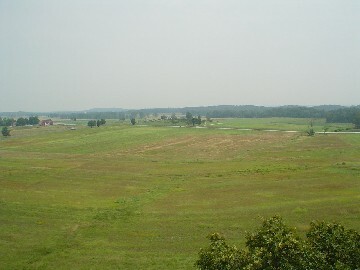 There are many opportunities for guided tours around the vast battlefield. This is at the cemetery near the Visitor's Center where we started out. It doesn't look it in this picture because all the stones are imbedded in the ground but this is the large circular graveyard around the central monument for the soldiers killed at Gettysburg. A closer look at the central monument. The tour guide walked us around it and explained the significance of each figure, their dress and what they are holding. Having the story told like that brings this sculpture to life. From the cemetery you can look across to see the Seminary spire (the small white form in the center of this picture). From the Visitor's Center we left on the bike to make the huge loop around the actual battlefield. This picture is taken not too far from the Seminary on the north end of Seminary Ridge where the Confederates under General Lee took up their position opposing Cemetery Ridge. Somewhere near here is where General Lee ordered the ill-fated charge by General Picket...across this field and up hill into the strongly defended center of the Union army on Cemetery Ridge. As you continue south on Seminary Ridge you come to where you can see the Roundtops, marking the south end of the Union line. This is the General Lee monument near the center of the Confederate line on Seminary Ridge. A closer look at the old man on his mount Traveler looking down on us and ours...The Big Dawg. This pastoral scene near the Peach orchard was the site of some of the bloodiest fighting of the battle. General Longstreet's mount rears while the Big Dawg patiently waits in the background. As you loop around the south end of the battlefield the sweeping farm fields give way to rougher terrain. Down in between the lines, below Little Roundtop is this jumble of rock called the Devil's Den. It looks like a great place to hide but a lot of soldiers died here. The view east from Devil's Den looking up at Little Roundtop. They say the range is around 800 yards...I am surprised to learn it is well within killing range of a skilled marksman with a rifled musket. After a long walk up a steep path on Big Roundtop we come to this monument commemorating Col. Joshua Chamberlain's heroic defense of the Union's left flank with the 20th Maine. Continuing north from Little Roundtop we come back to the center of the Union line on Cemetery Ridge marked by this "copse of trees". The view is now back west across the fields to the Confederate held Seminary Ridge. One last shot as the camera batteries die...looking west across the field that General Picket was ordered to cross to break the Union line. It was a cruel assignment, up hill, across a fence line and into the withering fire of Union cannons loaded with grapeshot. Lee was determined that a successful charge would win the battle, but it was not to be. A gentle rain is falling as we round the downtown square on our way out of Gettysburg headed for Niagara Falls.